Synonyms: Spondias cirouella, Spondias crispula. Red mombin is a native of tropical America. It has spread and naturalized throughout the tropics all over the world. It is commonly cultivated for its fruit. The fruits are sold mostly along the roads and streets as well as in the native markets. 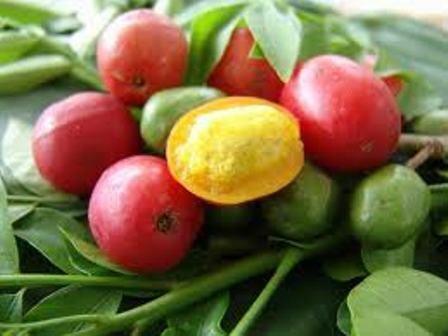 Red mombin was t carried by the Spanish explorers to the Philippines, where it has been widely adopted. 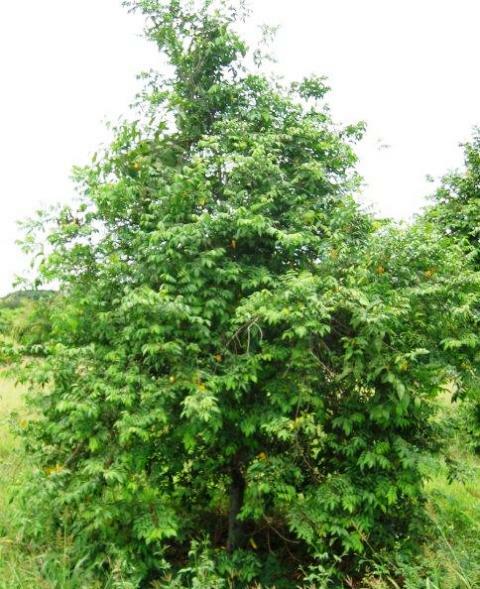 The tree is naturalized throughout much of Nigeria and occasionally cultivated for its fruit.. In the United States, some people have planted in Florida as a novel fruit. 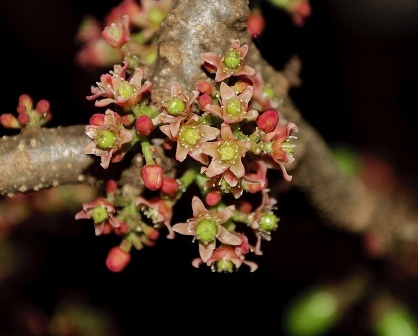 A deciduous shrub or small low branched spreading treetree in lowlands, or a spreading, thick-trunked tree reaching 7.5-15 m; branches thickish and brittle. Leaves alternate, compound, bright-red or purple when young; 12-25 cm long when mature; leaflets 5 to 19, nearly sessile, obovate to lanceolate or oblong-elliptic,leaflets 2-4 cm long; oblique toward the base and faintly toothed toward the apex. Flowers tiny, 4- to 5-petalled, male, female and bisexual, red or purple and borne in short, hairy panicles along the branches, appearing before foliage. Fruits looking somewhat like plums, borne singly or in groups of 2 or 3, may be purple, dark- or bright-red, orange, yellow, or red-and-yellow; varying from 2.5-5 cm in length and may be oblong, oval, obovoid or pear-shaped, with small indentations and often a knob at the apex; skin glossy and firm; flesh aromatic, yellow, fibrous, very juicy, with a rich, plum-like, subacid to acid flavor, sometimes a trifle turpentiney; adhereing to the rough, fibrous, hard, oblong, knobby, thick, pale, 1.25-2 cm long stone. Seeds small, seeds 5-7, contained in stone. Fruits are consumed fresh. These have a flavour resembling that of plums. The fruits are nutritious having a high calorific value of 74 kcal/100 g pulp because of the high carbohydrate content. The seeds have a thick gum coating and are commonly used in pork meats and chilli stews. This gum has good solubility in water and on hydrolysis yields polysaccharides. Aspartic acid and valine are its major amino acid constituents. 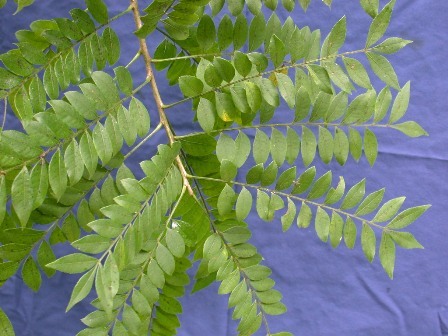 This plant also has a number of medicinal uses for this tree are reported; for swollen glands and trauma the leaf juice is taken orally, for headaches the crushed leaves are applied as a head bath, the fruit is consumed in large amounts to clear effects of constipation, other indications treated using preparations from this plant are dysentery and diarrhoea. Tree parts also used in preparation of a herbal remedy for sore throat. The leaves of this tree exhibit anti-bacterial properties. Red mombin is mostly propagated by seed. However, its plants can also be raised from cuttings. The large tree has a light crown. It can therefore also be planted with other tree species. The plant enjoys very humid soils. The seedlings are delicate, and suffer high mortality. Flooding is tolerated better by some trees than others. Increasing P and K fertilization would improve yield and fruit quality. Tree defoliation affects the mean number and weight of fruits per tree. Lopping can be done to manage tree growth; however severe defoliation may result in virtual failure or reduced seed production in the year of defoliation. The mite Brevipalpus salasi produces an irregular yellowing of the leaves and a slight scaly appearance to fruits of this plant. Parasitizing fruit flies (Anastrepha spp.) dwell on this plant. 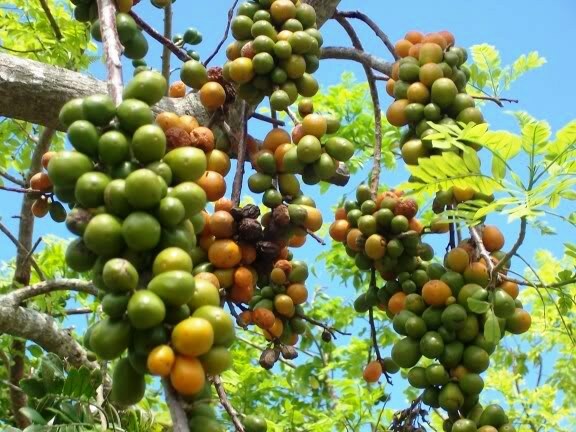 Cultivation of this fruit should be extended as the fruits can be processed a number of value added products like jam, jelly, juice and beverages, vinegar, vine etc.